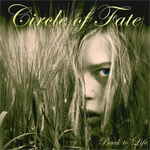 On Back To Life, female-fronted Chicago rockers Circle Of Fate pick up where the left of from 2006's Dawn Of A New Era delivering intense, heavy melodic hard rock. With few exceptions, the songs of Back To Life pound with heavy riffs and shudder with enough distortion to edge close to heavy metal, or at the very least modern hard rock. Catch a glimpse of Danny Charatin's beefy bouncer frame with his ham-fisted fingers wrapped around the neck of his guitar and you may wonder how far away Circle Of Fate is from becoming another Slayer. It'll probably never happen. With Michele Caruso on lead, Circle Of Fate is closer to Pat Benetar if she had gotten heavier with meat hook guitar chops and lost some melody and range; Back To Life is quite heavy rock. Listening to Back To Life one cannot ignore the heavy riffed intensity. It permeates the disc like the muted production that often muffles Ms. Caruso's vocals. Yet, within there are true moments of glory. Skeletons, for instance, is blessed with a great bass line and performance. My Religion delivers a heavy rock and roll style groove with a quicker pace under girding one of Caruso and Charatin's finer performances. The near metal motif arises on What If and on the better heavy rocker Your Gone which swings between intensity and subtlety. Back To Life finishes with the abnormally catchy and melodic (as compared with the rest of the album) It's All About You where Michele shines the brightest. If they still existed with some meaningfulness, this song has single written all over it. Chicago's Circle Of Fate's Back To Life delivers heavy melodic hard rock with modern rock intensity equaled in fervor by Michelle Caruso's whiskey and leather vocal performance. As Circle Of Fate brings on their heavy repertoire, they may be one best band's blending classic hard rock sensibility with modern rock trends, and that in itself is quite an accomplishment. Recommended! Chicago's Circle Of Fate's Back To Life delivers heavy melodic hard rock with modern rock intensity equaled in fervor by Michelle Caruso's whiskey and leather vocal performance.